Expand your horizons, expand your organization skills. 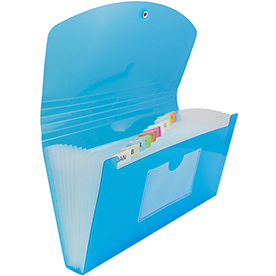 With our expanding files, being organized has never been easier. From important work documents to at home recipes, from scrapbooking materials to wedding invitations, our expanding files will be able to organize fully. Whether you want to organize alphabetically, numerically, or by importance is up to you! This page is categorized size to make it easy for you to navigate through the files you need. 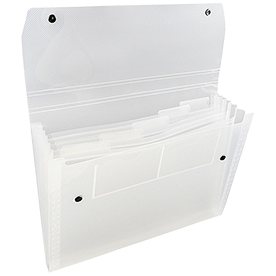 Our Coupon Size Accordion Folder is great for separating your coupons and receipts. These are available in beautiful pastel colors to make sure that your office style stays intact. Need to store all of your checks or invoices? 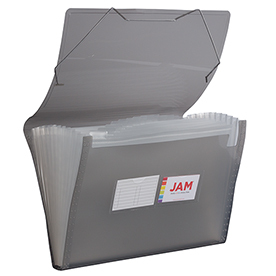 Try our Check Size Accordion Folder! With thirteen pockets available, all of your organization needs will be met with flying colors. 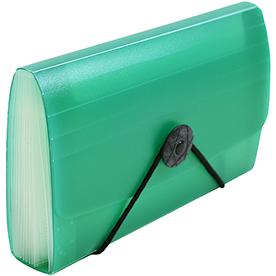 When you need expanding files for your workplace or home office, our Letter Size Accordion Folders and Legal Size Accordion Folders are here to save you. Pick from either 13 pockets or 6 pockets, either snap closures or elastic closures. Try our Legal size, available in 13 pockets, for those important work documents. This way you'll be super prepared for that presentation of yours! You'll certainly want to expand with these expanding files, so start shopping today!